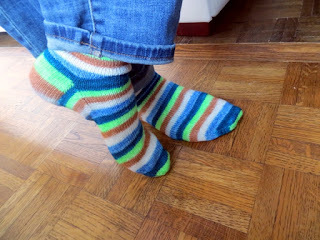 Putting on a freshly blocked pair of handknit socks the very first time is a bit of a leap. They're new and perfect, you want to show them off to their best advantage, and also - they aren't yet broken in, so they feel like teeny tiny rocks pressing into the bottom of your feet while you walk. This isn't something I notice much when I break in a new pair of socks in the normal way. By which I mean, knit a pair of socks, block them, wear them, repeat forever if possible. 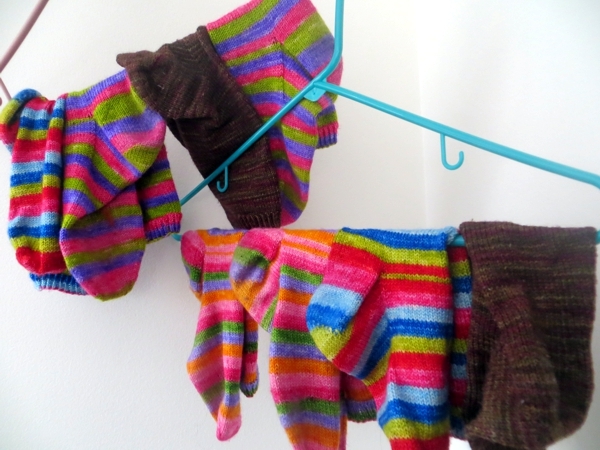 But as you may recall, I knit seven pairs of socks without running in ends or grafting their toes while I was preoccupied with moving house and plotting our huge renovation, and now I am breaking in seven pair of socks at once. Plus some other new pairs from the last few years that I set aside to save for special occasions until recently when I decided that Special is Now. 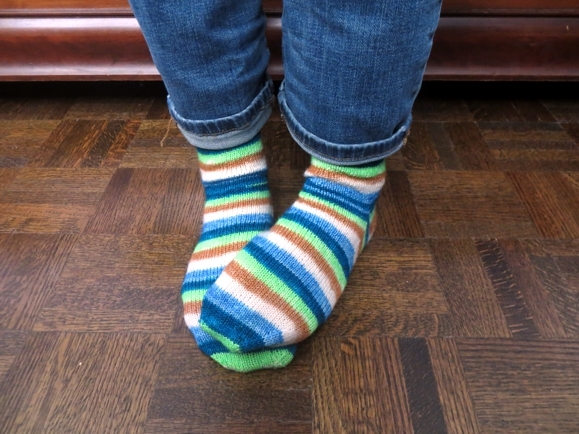 When you are breaking in new socks, you want them to have maximum opportunity for their fibers to felt a little. 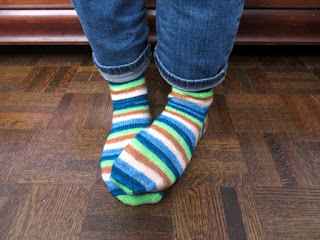 Even superwash wool will do this if you're walking around with closed shoes on - all you need is hot water and friction and the individual hard stitches will soften a little and blur into each other like a gently painted watercolour. So you want to pick a day when you're walking a lot, but not so much that the hard stone feeling will bother you. And it should be a day when, if you're visiting somebody, you're not expected to take off your shoes, because you don't want to give your feet a chance to breathe before their work is done. If conditions are perfect, you'll have a very comfortable pair of socks by the end of the first day. And then you will want to knit another pair of socks. Have a great day today whether or not you are breaking in a new knit, and I'll see you tomorrow! PS if you remained awake through yesterday's post about my appliance dilemma you may be happy to know I figured out the refrigerator after I opened a top-freezer model and remembered what a pain they are. also, the nice lady at The Bay explained that KitchenAid and Whirlpool use the same mechanical refrigerator guts, and I realized I like the Whirlpool's fridge organizers better, and it doesn't actually matter to me for all the handles to match. Yay! might get to knit today!